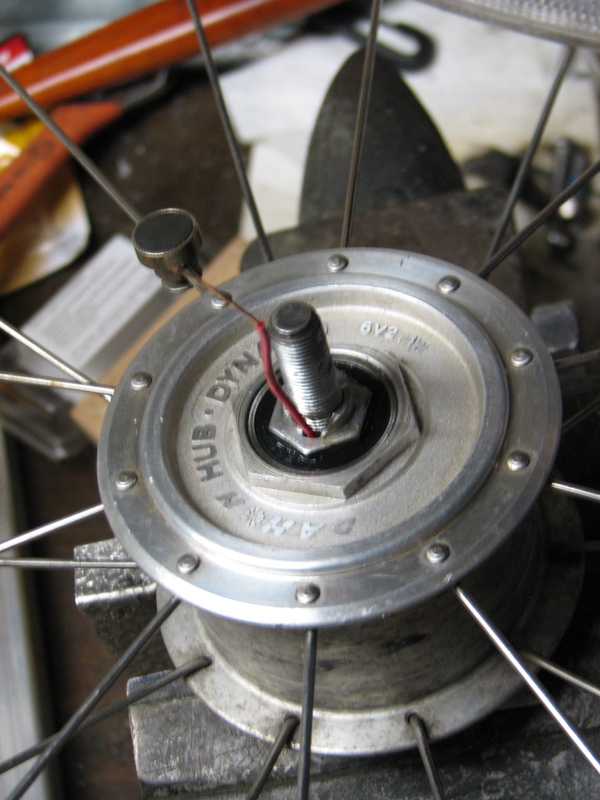 Frequent Hubstripping reader and commenter Steve Weeks put together the following wonderful writeup about how he fixed his Joule dynamo hub. Hopefully it will be useful to other readers as well. The Joule hub is a simple affair. It comprises a stator, a rotor, two bearings and the necessary structural parts to hold them together and allow the electricity produced to be conducted away to do its job. The “stator”, or stationary part, consists of a coil of wire would on a core of steel with many poles (Image 1). 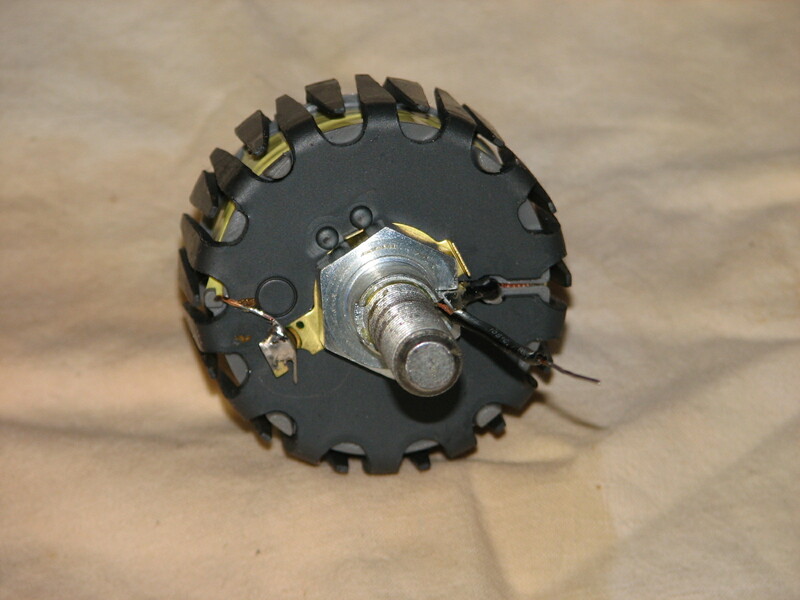 The core is directly connected to the axle, and does not rotate with the wheel. 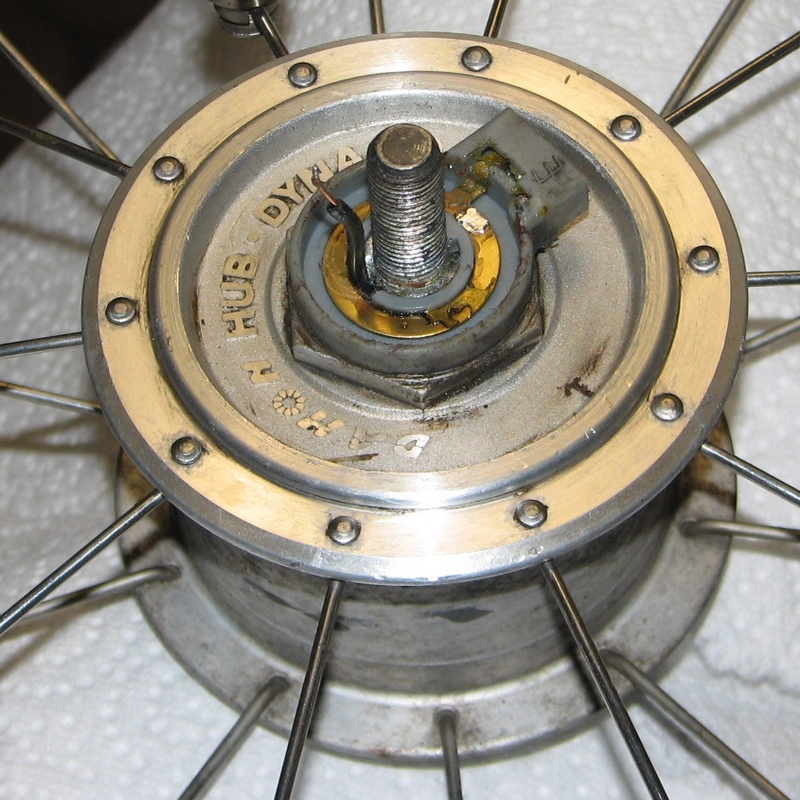 The “rotor”, the moving part, is the hub shell itself, which has four ceramic magnets mounted on its inside circumference (Image 2); these magnets constitute the “field”. 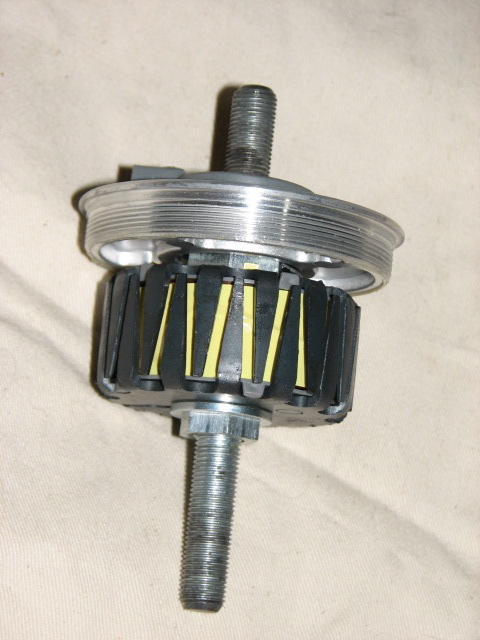 This is the reverse of an “automotive” alternator, which has a stationary stator coil surrounding a rotor which serves as the field coil. The Joule hub contains no voltage regulator or rectifier; it is a simple alternator and, except for the bearings, has no parts that can wear out under normal conditions. There seem to be two basic types of problems that can occur with this level of simplicity: electrical conduction failure, and bearing failure. I am able to report on one failure of each type. 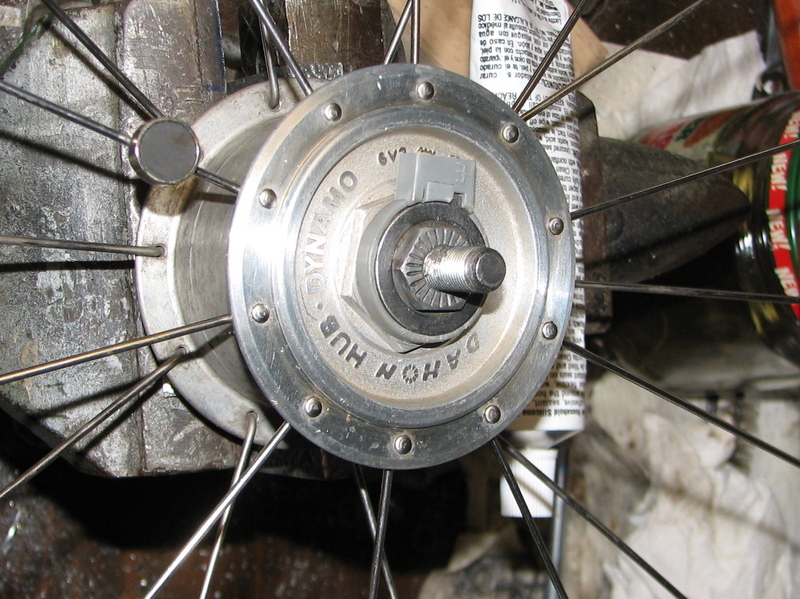 I have been using the Joule hub generator on my two Dahon folding bicycles for about five years. During that time, I have been generally well-pleased with the hubs’ performance. 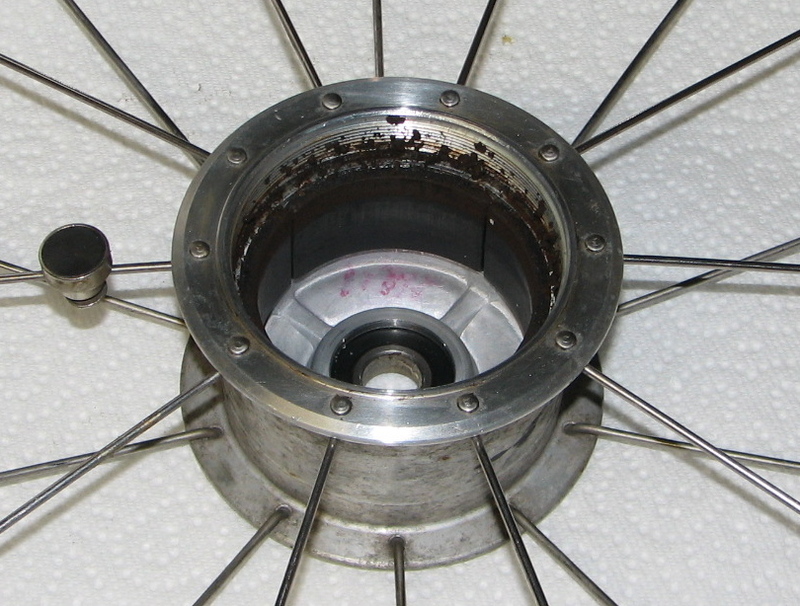 It was always a matter of curiosity what was inside one of these hubs: Are the bearings cartridge or cup-and-cone? Are they amenable to service for prevention or repair? The hub’s specifications suggest that it is not meant to be serviced. My oldest Joule hub, an early production model, acquired in 2005, stopped working in early 2007. Luckily, I had acquired a third one as a “spare”- just in time, as it turned out. Here was what I was looking for: a no-lose opportunity to examine the inside of a dynamo hub and see if it was able to be serviced. The hub began to be erratic providing enough electricity to light the Hella lamp. A few times the light went off by itself; in some of those cases, it came back on. Eventually, no light was produced. A voltmeter attached to the output of the hub would show voltage, but it was erratic and would not light the lamp. All the wires were checked and found to be OK; connecting the wires to a 6 volt battery resulted in normal performance of the light and on-off switch. I installed a spare wheel and brought the broken one in; on the bench, an ohmmeter showed an open circuit between the output terminals. Interestingly, there was also an open circuit between the “ground” terminal and all other metal parts on the hub, which was a clue. Diagnosis: open (broken) circuit somewhere in the hub; the wire of the stator windings could be broken, but a defect in a connection seemed more likely. It is not necessary to open the hub to address the connectors. The parts of the hub that are especially vulnerable to corrosion are all accessible with simple tools. 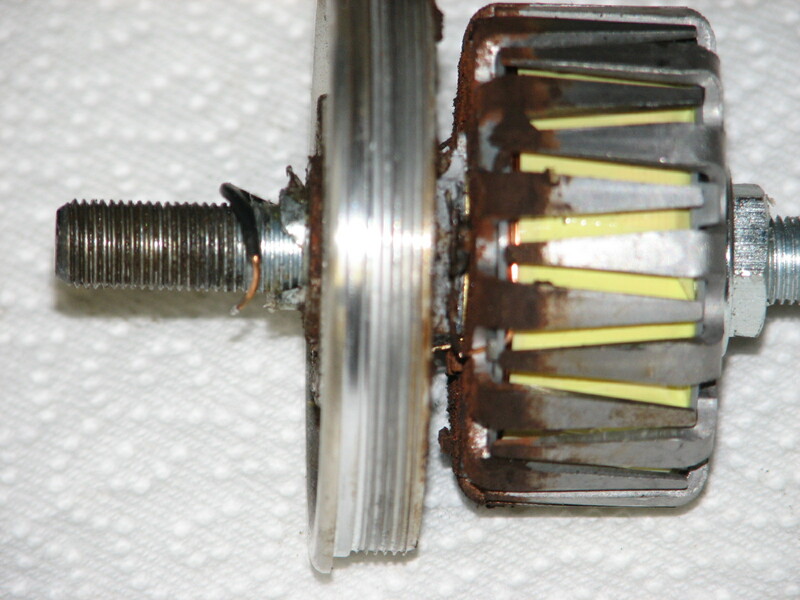 1) Remove the 17mm locknut (Image 3), then gently pry up the metal (steel) washer on top of the connector assembly (image 4). This was a bit tough to get started because there is epoxy cement holding the parts together. I think a sharp knife worked under the edge of the connector would work better than the screwdriver I used. 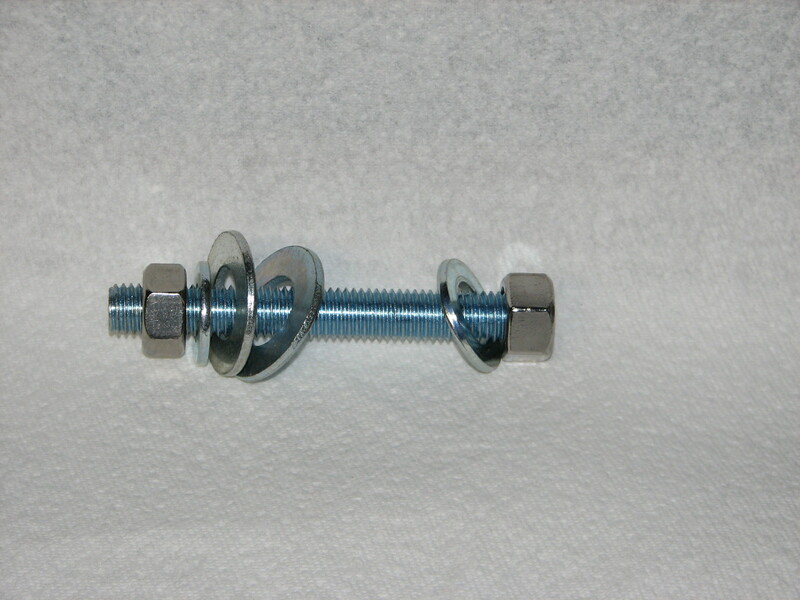 I stabilized the axle for this operation by using two axle nuts in a “jam” configuration on the non-output side of the hub and clamping the most outboard nut in a vise, as seen in the image. Note the scrap aluminum used to prevent scarring of the nut. Underneath the washer is the “ground” connector ring. This is made of brass, and is supposed to be in good contact with the underside of the overlying steel washer. If these look like the parts shown in Image 5, you probably have found the problem. 2) Tease the ground connector and its ring out of the gray plastic shell, being careful not to bend it. Then it will be possible to gently pry out an inner plastic piece (Image 6) that separates the ground from the “hot” connector (the convenient “tab” is a good place to start). The “hot” connector is another brass piece which has a wire soldered to it (Image 7). 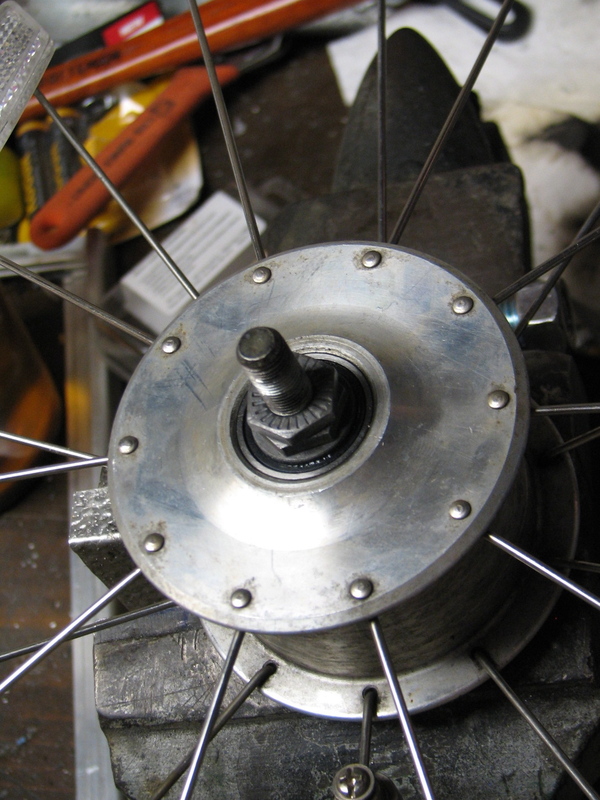 The wire is the “hot” side of the hub’s windings; the other end is connected directly to the axle inside the hub (Image 8). Carefully unsolder the wire from the ring (Image 9). The wire may be straightened (Image 10), allowing the “hot” connector to be removed for cleaning. The corrosion may be removed with Naval Jelly or other chemical means. 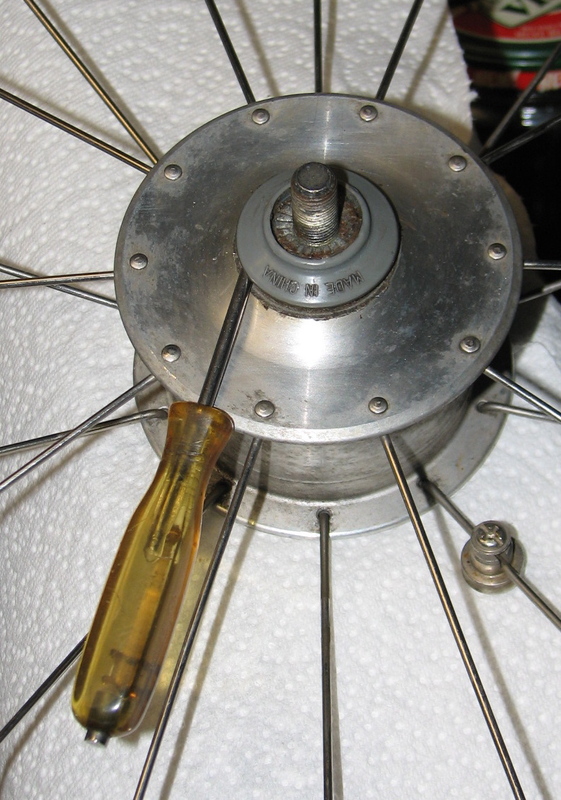 A brass or stainless steel wire brush in a Dremel tool can be used cautiously to dress the surface. (image 11). Reassembly is the reverse of the previous process. 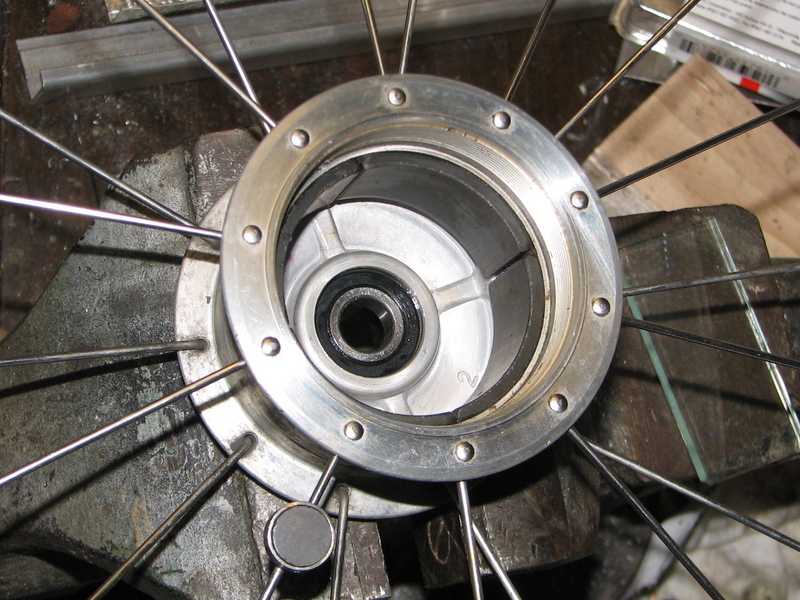 In the Spring of this year, 2010, another of my Joule hubs began to display a little looseness in the bearings; the hub could move a millimeter or two sideways along the axle. I don’t remember exactly how this came to my attention. The wheel seemed to turn freely, considering the magnets. By the Summer, I had the feeling that the bike was “harder” to pedal. When I tried lifting the bike and spinning the wheels, the rear was fine (whew! ), but the front would not spin even one full revolution. It was almost like the generator output was short-circuited, but the light worked normally. Fortunately, I had a spare Joule-equipped front wheel with normal bearings, so I installed it and found the bike much easier to ride. 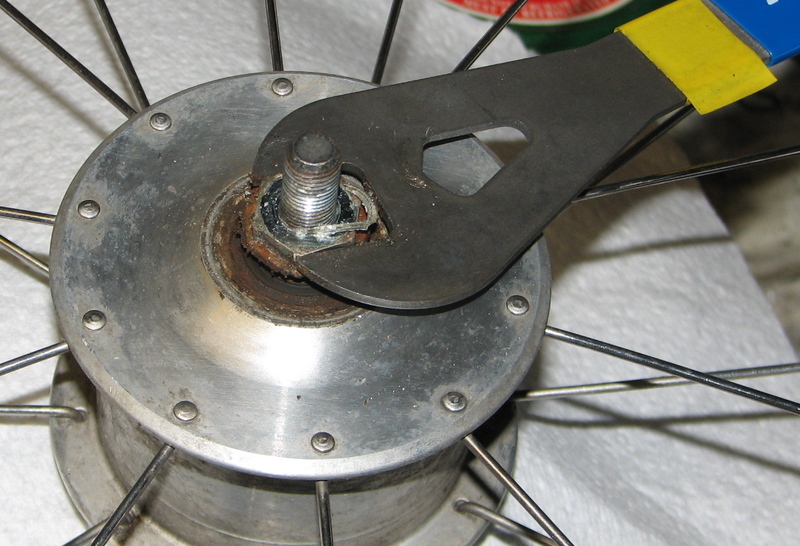 The old hub’s axle could not be turned by hand off the bike. 3) Remove the jam nuts from the non-output side without clamping the output side axle in the vise unless you have an axle clamp. 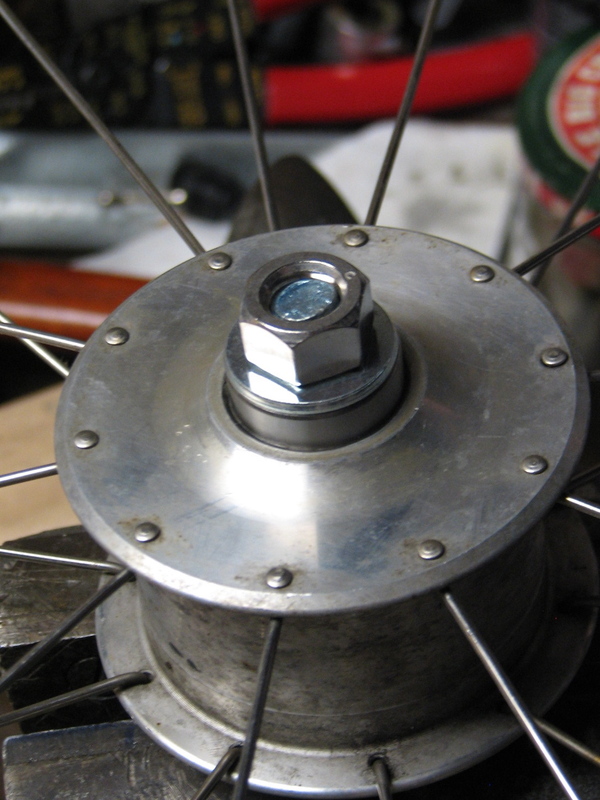 Being careful of the wire so as not to damage it, place the axle nuts on the output side and jam them. NOTE: the collection of removed parts should now look like Image 16. 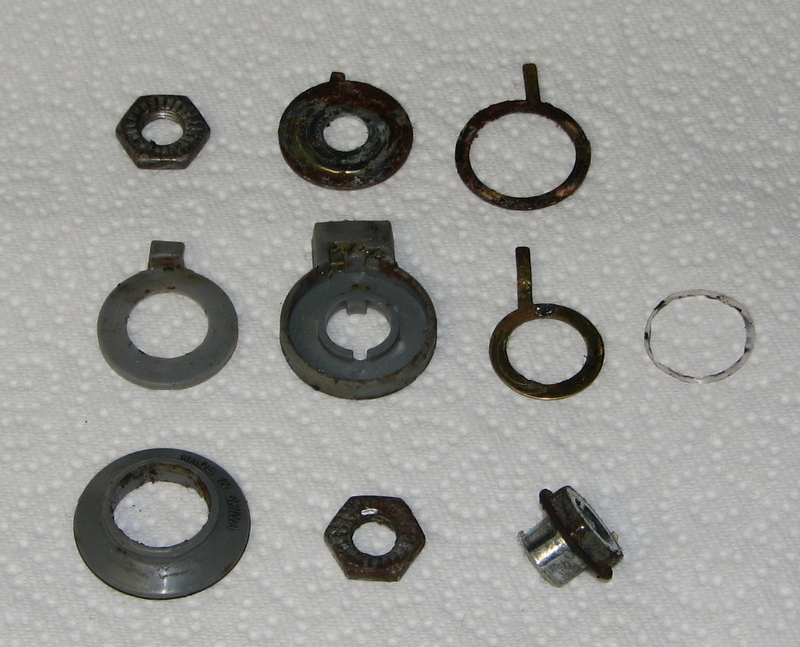 From left to right and top to bottom, the parts are in order from locknut on the output side to locknut on the non-output side. The thin, transparent plastic ring seen at the right end of the middle row was discarded. 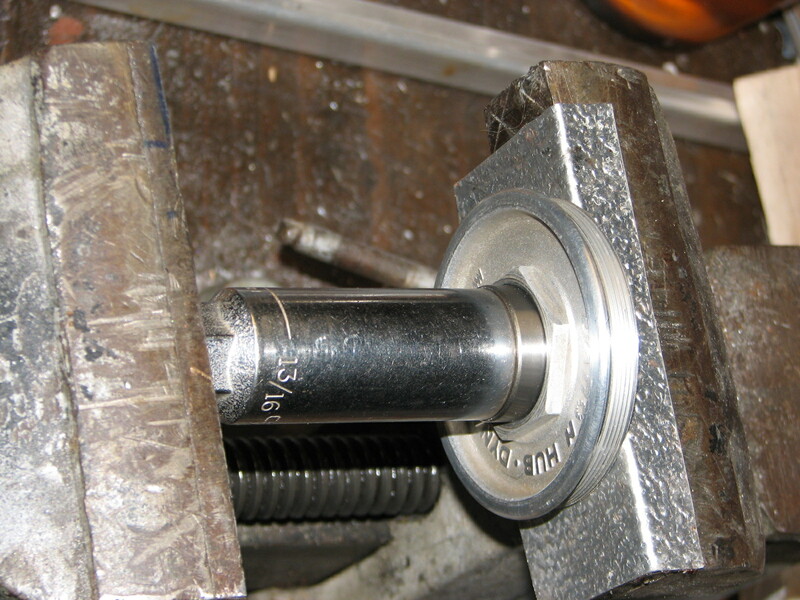 7) Stabilize a 1-1/4″ (32mm) socket upside-down in a vise. I did this by setting the socket on a 1/2″ drive breaker bar clamped in a vise. (Image 17) The axle will interfere with the drive seating all the way into the socket’s square hole, but I was able to simply set the socket on the drive without clicking it on. A deep-well socket would make this simpler. Notice that the lip of the socket has been ground off to permit maximum engagement with the rather thin hexagonal “nut” which is part of the output side bearing holder. It is *not* necessary to cut a window in the side of the socket; that was done for my first Joule disassembly when I did not realize that the connector housing could be removed separately from the bearing holder. On this particular hub, it is clear from Images 19 and 20 that it was the output-side bearing that failed. It looks as if water got into the bearing. 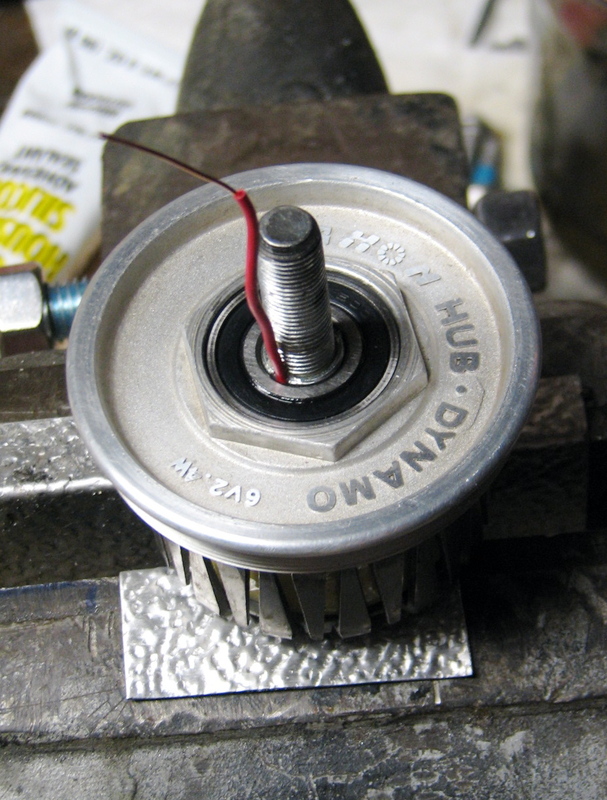 This bearing cannot be turned by hand; the non-output bearing feels smooth. Compare Image 20 with Image 21, which is of a stator from a Joule hub that was not failing. 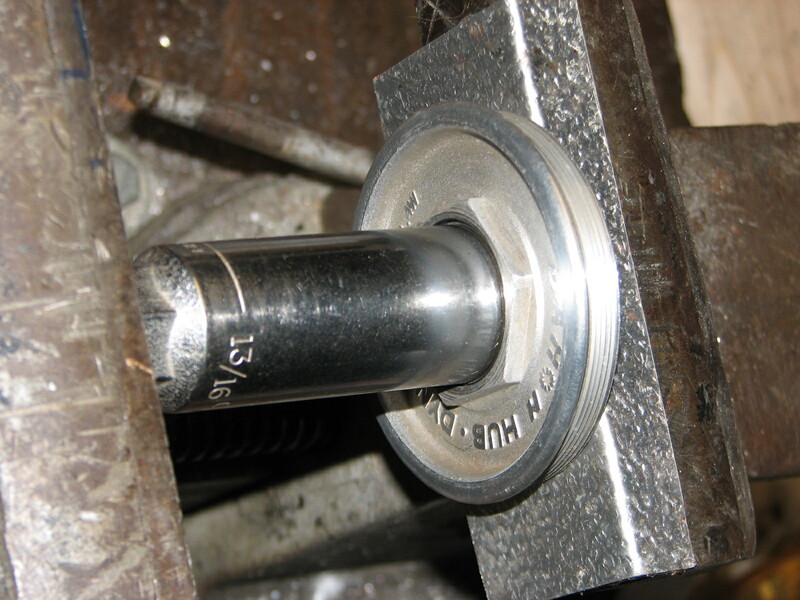 9) Pry off the hexagonal spacer (Image 22) that sits on the outside surface of the output-side bearing; it is held on with a bit of some form of adhesive, but should be able to be removed without difficulty. Do not turn it with a wrench! Doing so will wrap the output wire around the axle and possibly damage it. Should this occur, it may be possible to repair it; details further on. bearing’s inner race is identified by the blue “2”. In this particular hub there was quite a bit of corrosion damage to the bearing and superficial corrosion on the stator as may be seen. 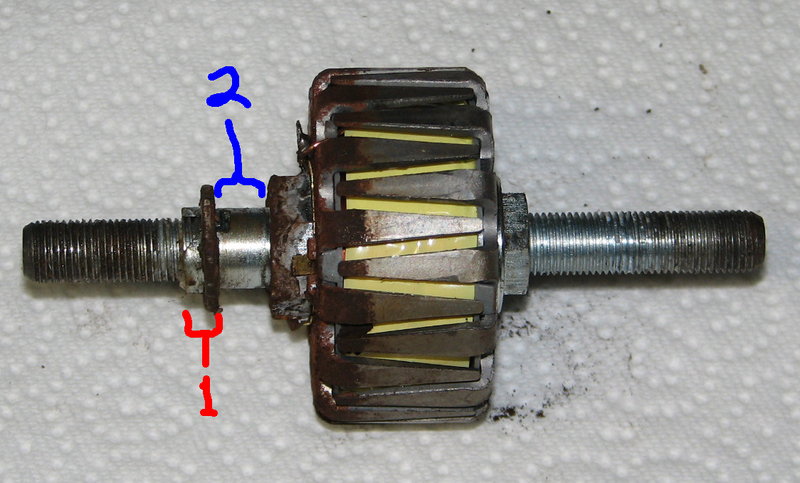 11) Once the stator is removed, the bearing itself may be removed by supporting the holder in the 32mm socket used in step 7, and driving it through (toward the *outside*) with a socket about the same size as the inner race struck by the plastic mallet. 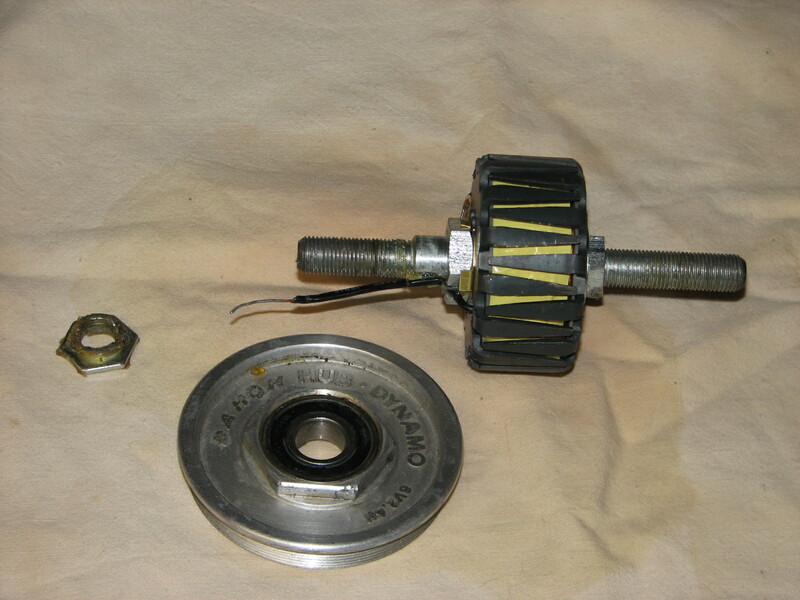 Image 25 shows an intact output-side bearing holder, bearing installed, and another holder with the bearing out. 12) The non-output side bearing may be removed by putting a large drift into the inner race and driving the bearing out while the hub is supported on a padded surface. A socket whose diameter is the same as the inner race may be used instead of a drift; a plastic mallet is recommended. Note that this is *not* the way to install the new bearings; they will have to be pressed in using pressure on the race with the tight (“interference”) fit to avoid damage to the bearing balls and races. This will be illustrated presently. function here. The magnets in the Joule hub are “ceramic” magnets, which may not be as susceptible to this strength loss. It is recommended to keep the stator inside the rotor anyway; better to be safe than sorry. 14) Now begins the reassembly of the hub! 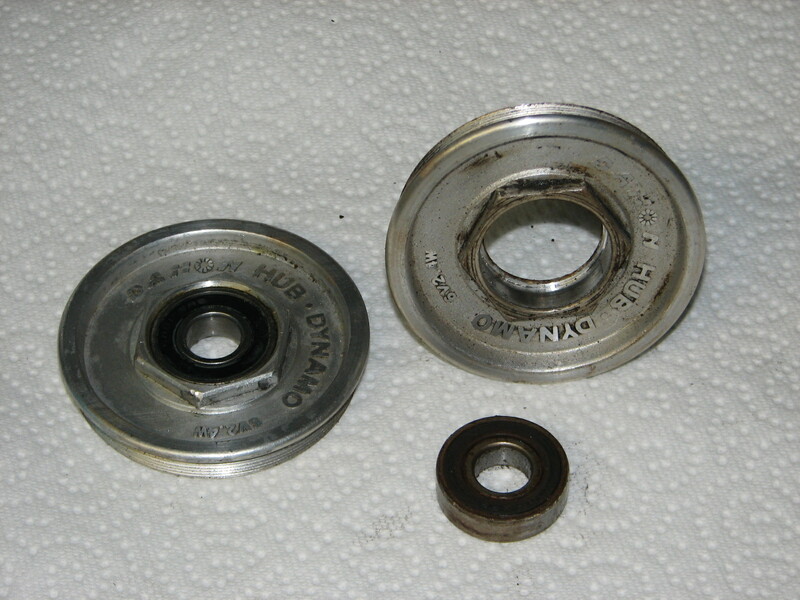 The output side bearing holder has been cleaned of all the old grease and corrosion, then the bearing seat area is coated with a bit of grease to facilitate installation. Image 26 shows the holder and the new bearing mounted in a vise. The vise is lined with a thin aluminum sheet to protect the holder. The bearing is about to be pressed into the holder with a Craftsman 13/16″ spark plug socket, which has an outer diameter slightly less than the bearing’s outer race. 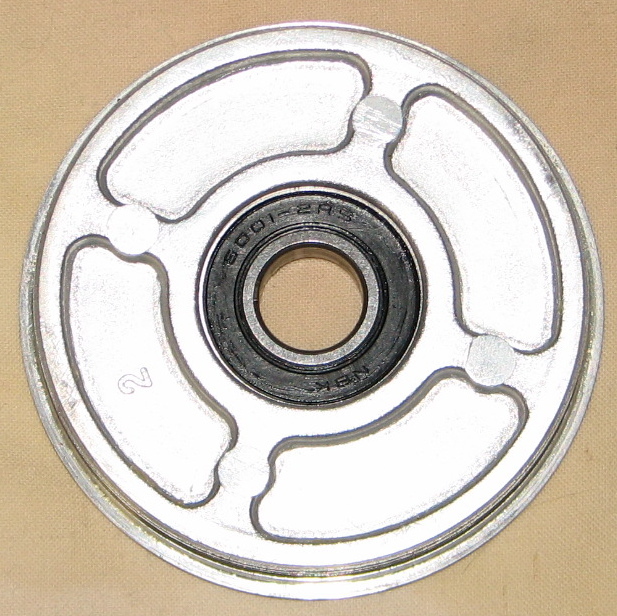 This is necessary to prevent damage to the bearing seat, while permitting the bearing to be fully seated. Image 27 shows the bearing fully seated… it can’t be seen! Note that no pressure has been placed on the inner race, which is unsupported at this point. This is important to avoid damage to the bearing. Image 28 shows the completed holder/bearing assembly. 15) Image 29 is the tool fabricated from metric hardware (from Ace! ); the threaded rod just fits through the bearing’s inner race. All this hardware set me back less than 5 bucks. 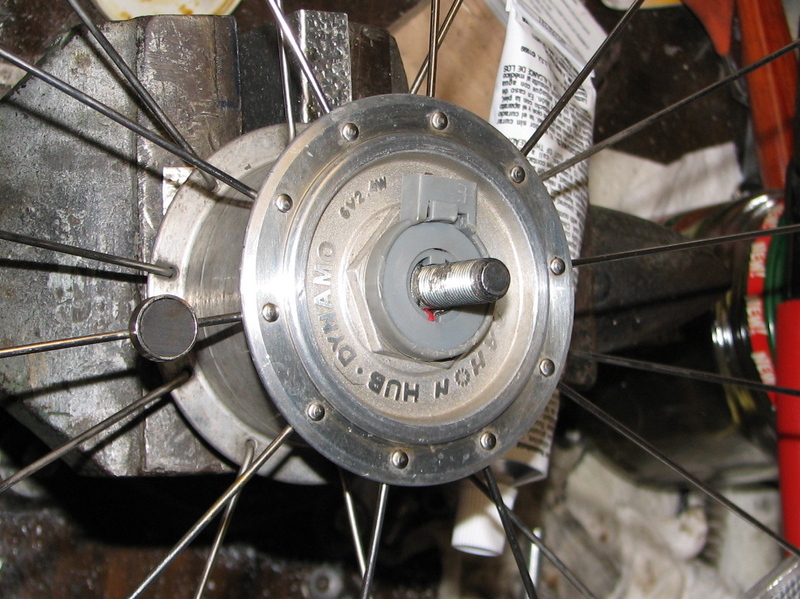 Image 30 shows the non-output side bearing with the tool in place. 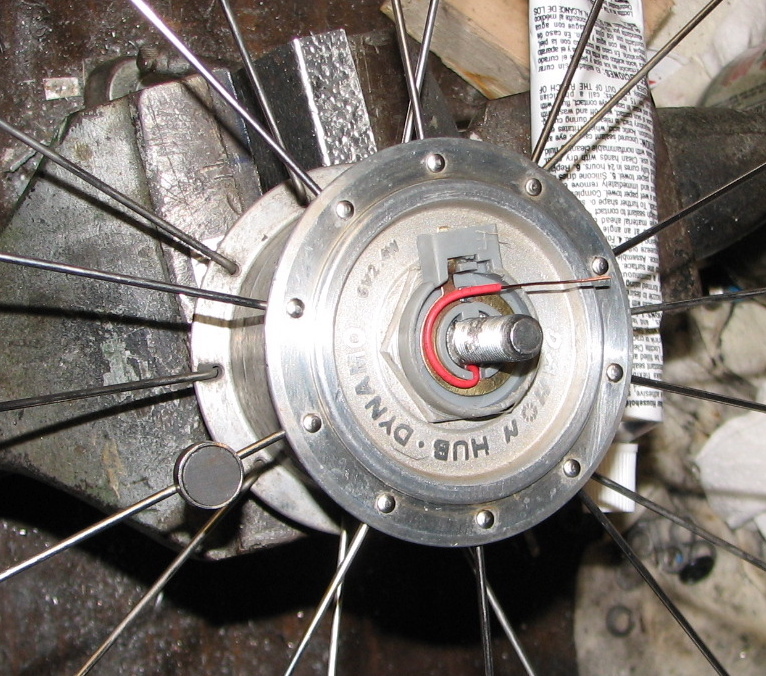 Note the washer that engages only the outer race of the bearing, since it is the outer race that is being pressed into the hub. Image 31 illustrates the output side with the tool in place. 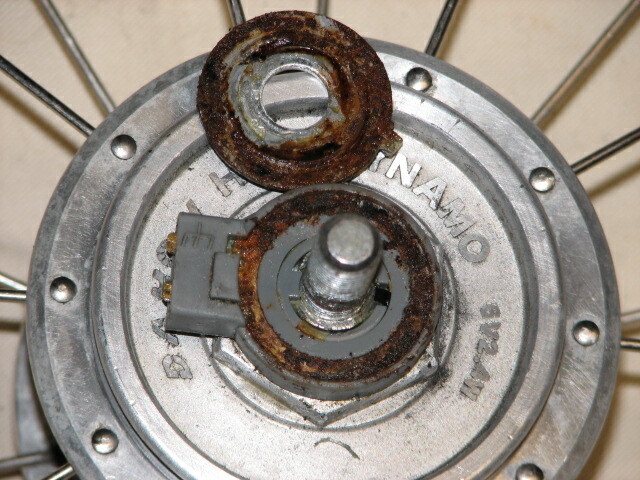 Note the bearing holder has been screwed in (just finger tight), and the washers transmit the load to the holder, not the previously-installed bearing. 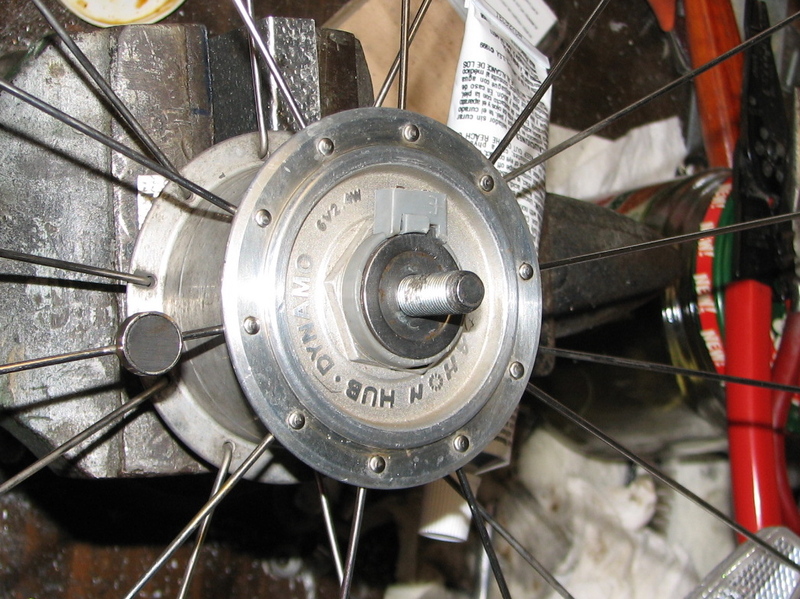 Image 32 shows the bearing being installed. There is not a lot of force required on the wrench, but the fit is very snug. 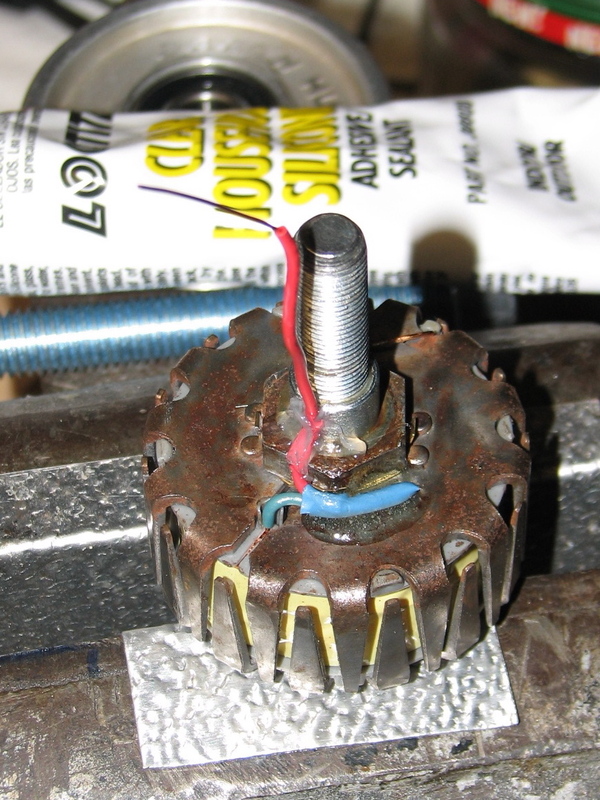 A view of the installed non-output-side bearing through the rotor magnet assembly is seen in Image 33.
of magnet wire soldered to the stub of wire from the stator. 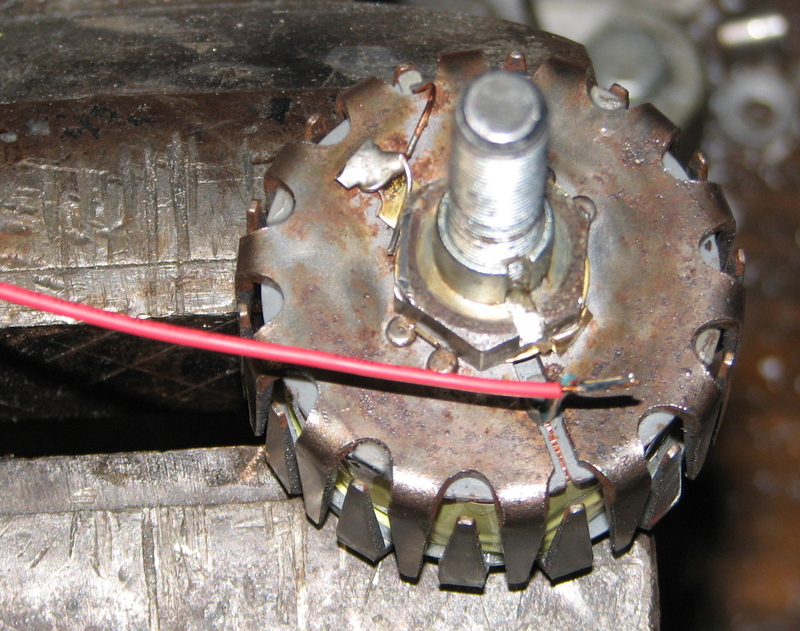 A short length of blue insulation removed from another wire has been slipped over the stub from the stator coil. Image 35 shows a length of red heat-shrink tubing placed over the new wire extension. 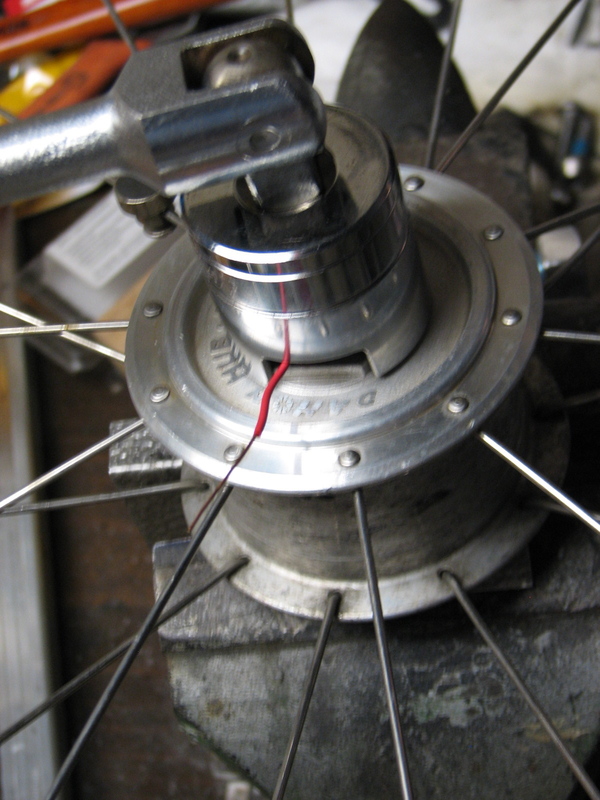 The joint is covered with a short length of blue heat-shrink tubing (Image 36), and the wire is positioned in a slot in a bushing on the axle; this slot allows the wire to pass through the inner race of the bearing cartridge. 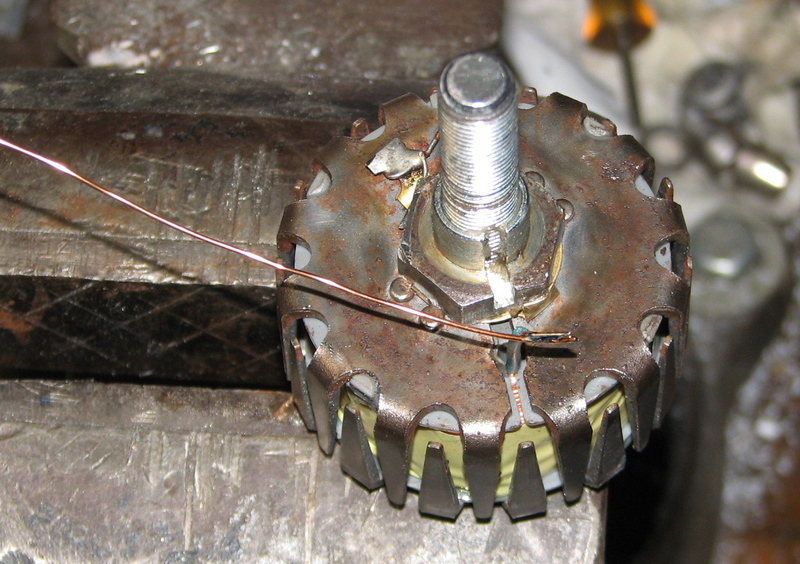 Note the hexagonal spacer, which (for demonstration purposes) has been placed over the axle; the bearing will be located between this spacer and the stator coil. to avoid displacing or damaging the non-output-side bearing. The notch in the socket, though unnecessary for disassembly as described in step 7, is handy here to avoid damage to the wire; however, with care damage to the wire may be avoided. Image 40: The installed cap and the non-threaded spacer in place. A small amount of silicone was placed between the spacer and the axle. 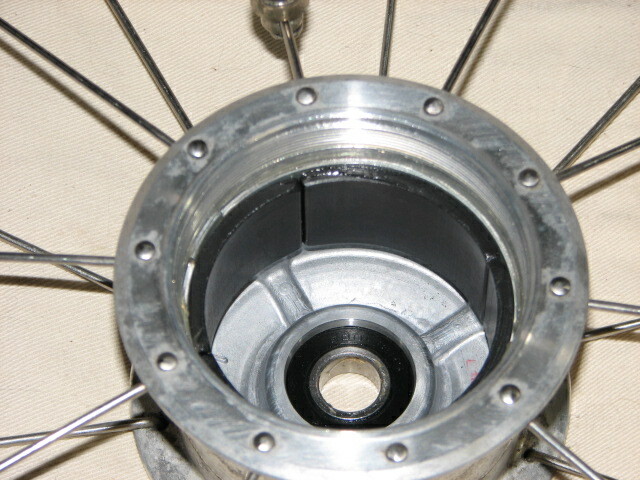 17) Image 41: The non-output-side bushing (also a slip fit in the bearing) is now fully tightened. Since these are cartridge bearings, there is no adjustment for bearing play. 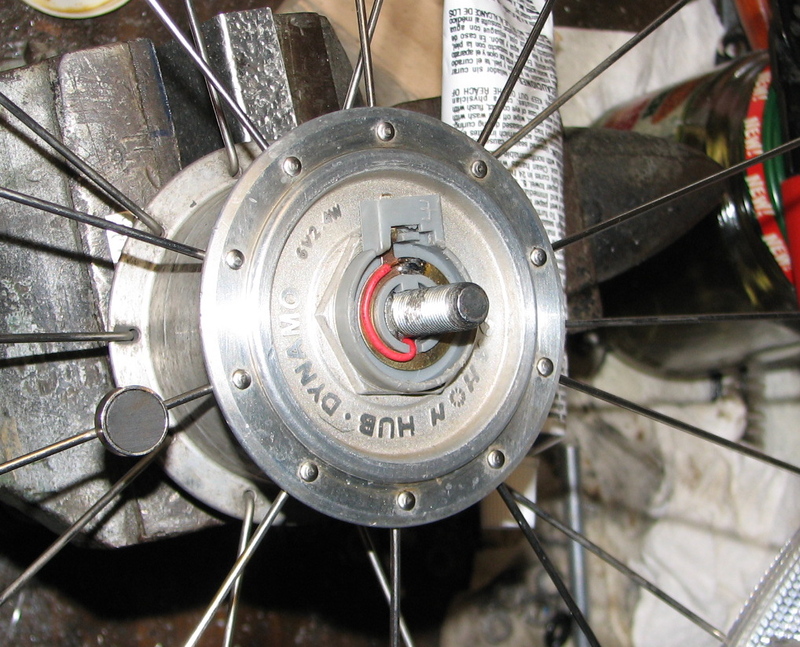 Image 42 shows the non-output-side lock-nut installed and tightened over the bushing. This completes the reassembly of the hub proper. All that remains is replacing the output connector parts, and the hardest part of that will be soldering the wire back on to its conductor ring. 18) Image 43: The output wire is passed through the gray plastic connector housing and bent around to see how long it needs to be (in this case, because the wire is new). 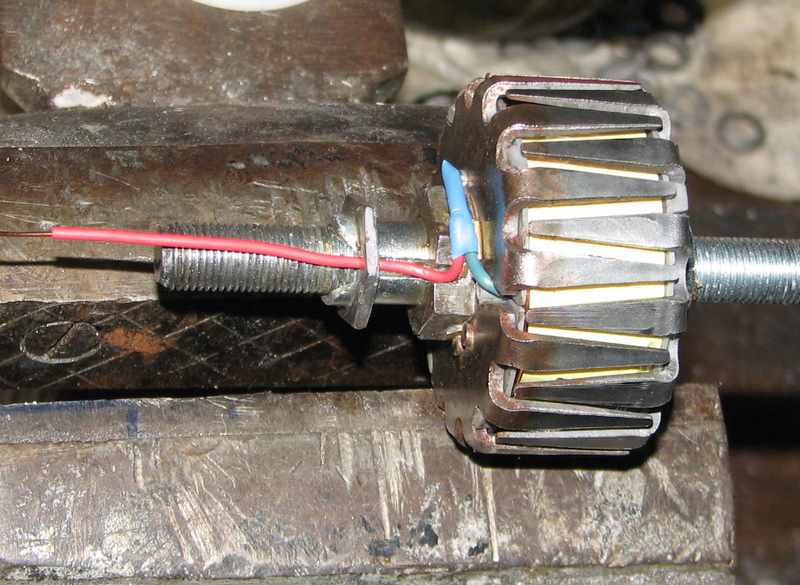 Image 44: The wire has been trimmed, stripped and soldered to the “hot” connector lead. The red insulation seen is a piece of small-diameter heat-shrink tubing; this was cut with a normal wire-stripping tool. Image 45: The plastic insulating washer in place. Image 46: The “cold” (“ground”) connector in place. Image 47: The outermost washer, protecting the connectors, in place. This washer is steel and will rust (badly) if exposed to salt and water (read: “Chicago Winter”). 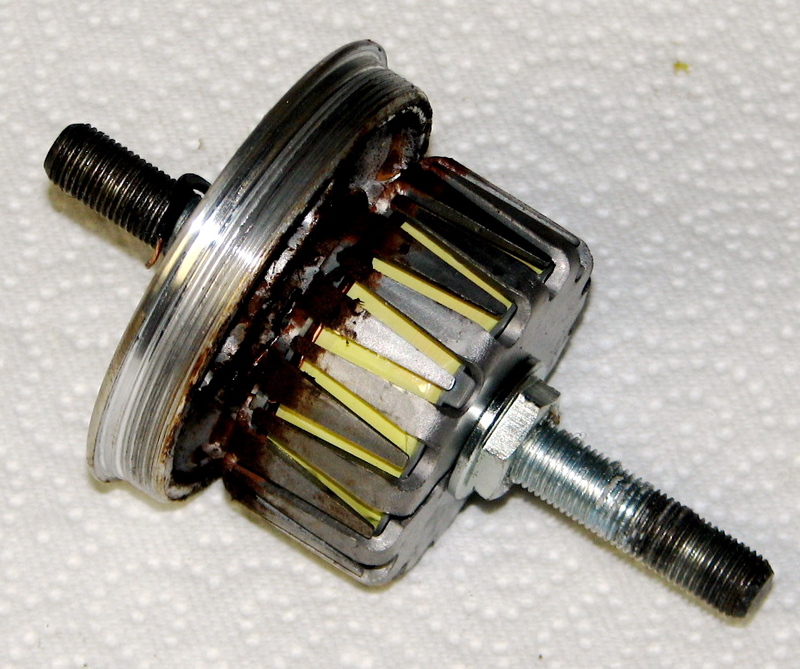 In corrosive environments, I recommend coating this end of the hub with silicone grease. 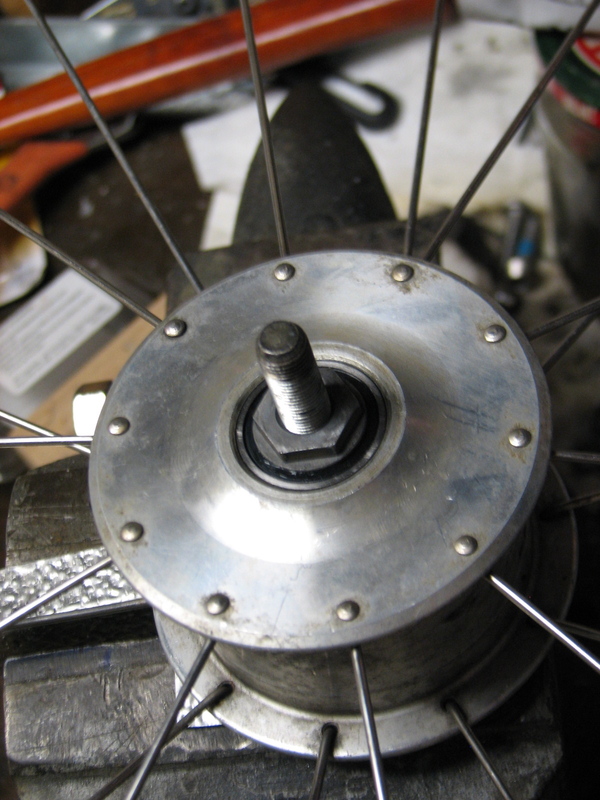 Image 48: After tightening the output-side lock-nut, hub assembly is complete! The axle has no play in it, and it spins quite freely except for the normal interaction between the magnets and the stator. It is like new, except now I probably should replace the rim, which is quite worn. Still, not counting my time (which is my own! 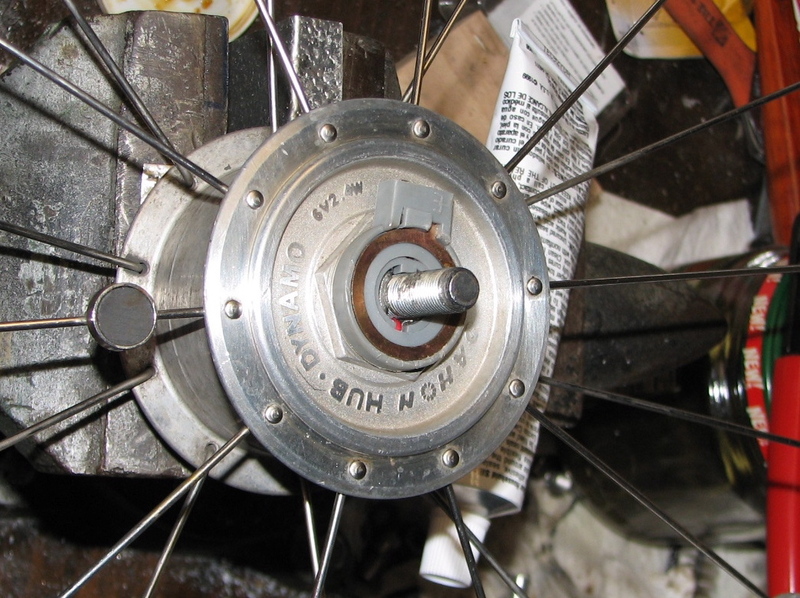 ), the cost of overhauling this hub is well under $10. Not too shabby. Hopefully, this is well-enough documented that anyone else can do this repair if they so desire. As far as testing goes, I plugged in a connector and hooked it to an AC voltmeter. Spinning the wheel, I get 10 volts easily. This is without any load; with a bulb connected the voltage would be less. Also, in case it is of interest, the electrical resistance of the stator coil is about 2 ohms, measured from the output connector. Both of my stators measure the same, so I suspect it is right. The important thing is that it is neither *zero* (short circuit) or *infinity* (open circuit). Here are some images of the bearings. Image 49 shows the inner aspect of the output-side bearing in its holder; the bearing identification markings are clearly seen (NBK 6001-2RS). 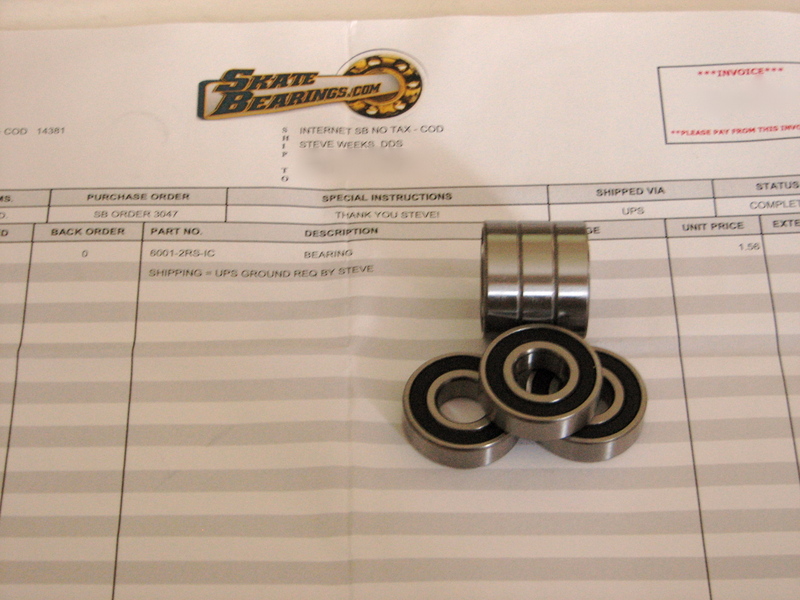 Image 50 shows the shipment of new bearings received from “SkateBearings.com” for $1.56 each, plus shipping. 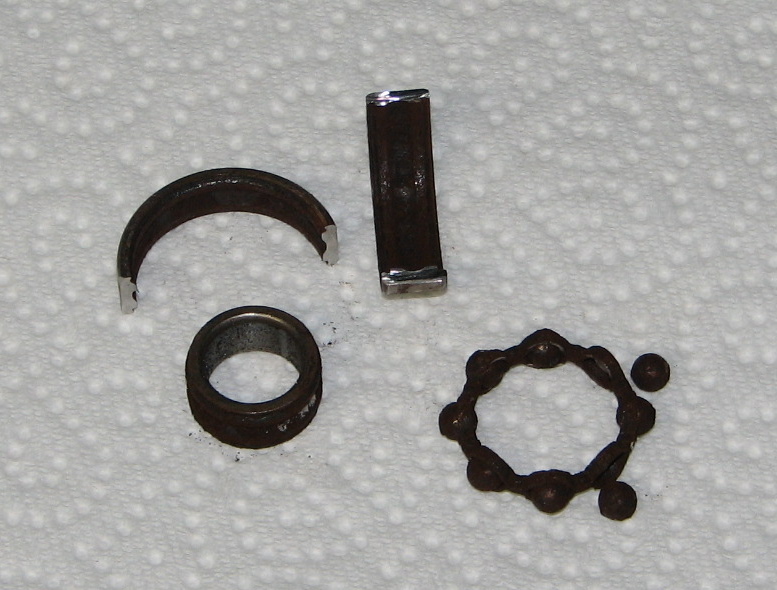 The failed output-side bearing, with its seals removed, is seen in Image 51. The last image (Image 52) is the bearing after being dissected… lots of rust there. 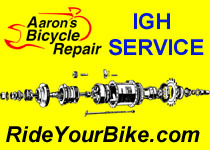 This hub made a dry rubbing sort of sound intermittently since it was new. I wonder if the bearing was partly corroded even then. I hope this is helpful to someone. At least now it is clear what’s inside one of these things. 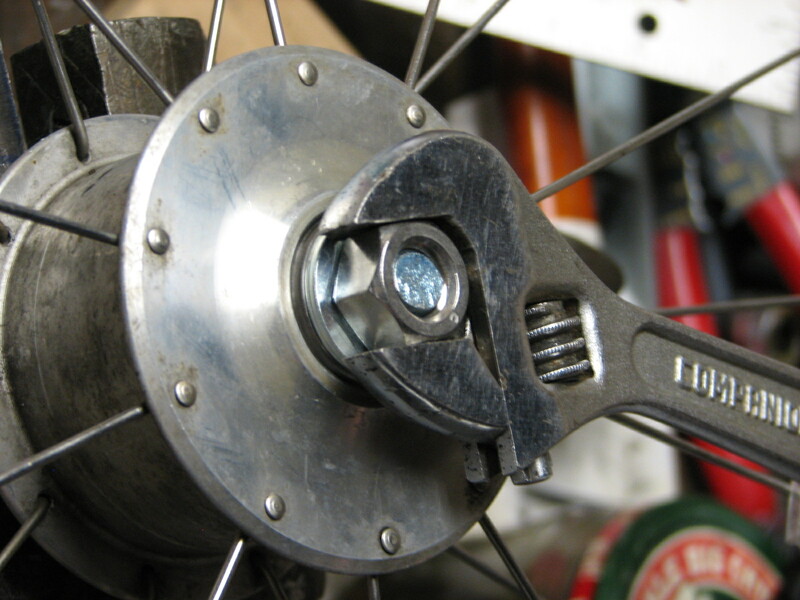 I ended up searching out a Brompton-Shimano hub available in the UK because I didn’t want to deal with the lost wrench(spanner) issue should I have to fix a flat on tour. 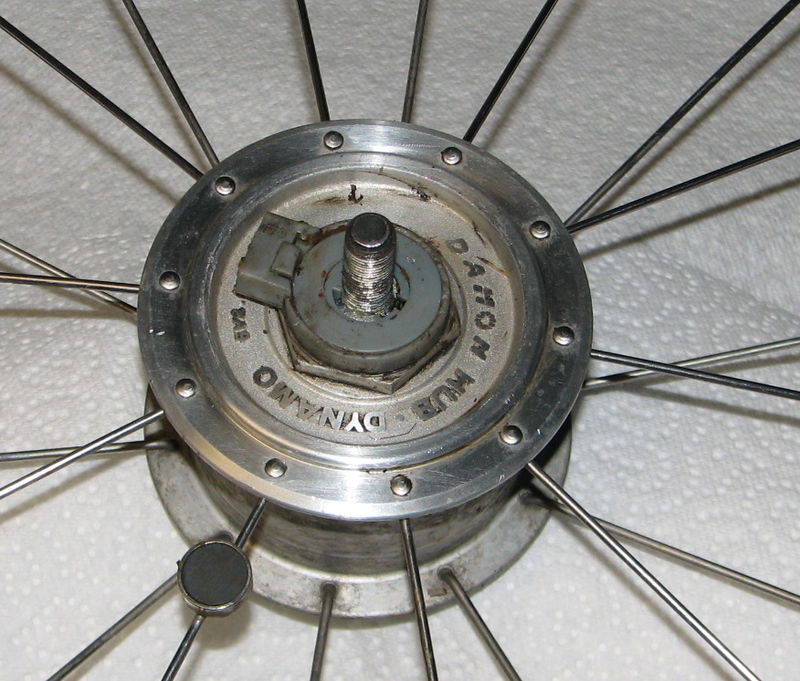 I suppose it might have been possible to retro the easier to obtain Dahon hub with a QR axle after seeing this. Great work documenting the fix. Thanks for the kind words. The axle on the Joule is an integral part of the stator as far as I can tell… I tried to disassemble it on one of my hubs and nearly destroyed the stator. It seems to me the only way to convert this hub to Q-R is to bore a hole through the axle! Obviously, it would be easier, cheaper, and more predictably successful to find a hub already equipped with the desired features, as you seem to have done. 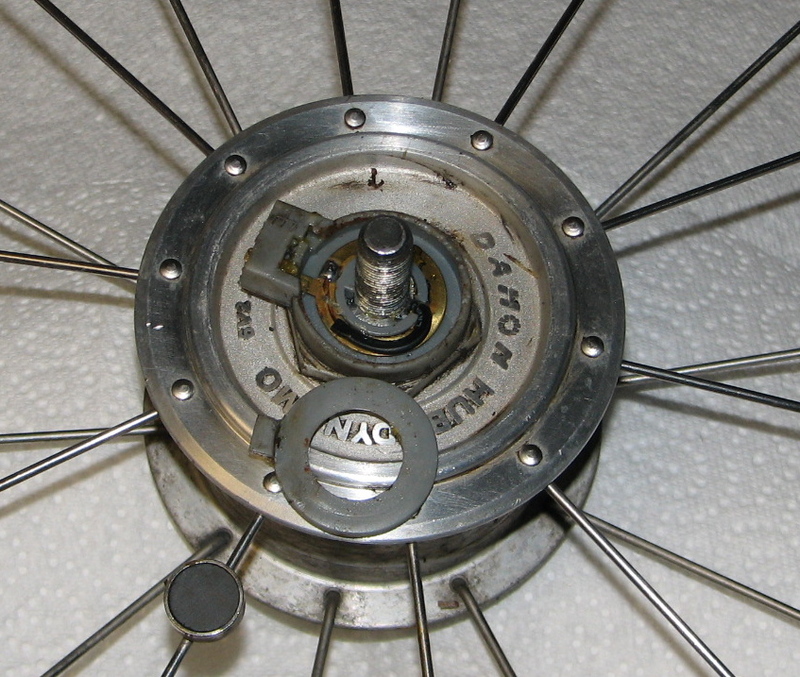 The exploded view above (Image 12) shows such a hub. Let there be light! 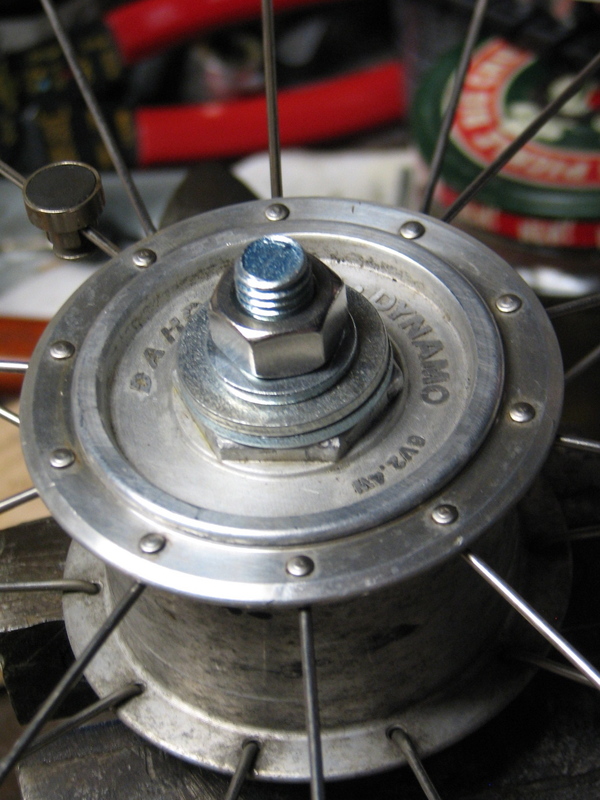 The Shimano dynamo with the exploded diagram is the standard 100mm version, I have the special narrow Shimano 70mm hub for folding bicycles. Well, I was not aware of that when I included that illustration. (Oops!) My 3 hubs are all 70mm, BTW, with solid axles. The possible advantages of a non-Q-R front wheel include some level of protection against theft and a stronger axle (maybe). The only real disadvantage, as you say, is the need to carry a spanner. In my case, it’s no additional trouble, because my rear wheel is also held on by 15mm nuts. Steve, it would have been great to find this page before I disassembled my hub! The axle is not an integral part of the stator, the retaining nut(s) are just really tight. 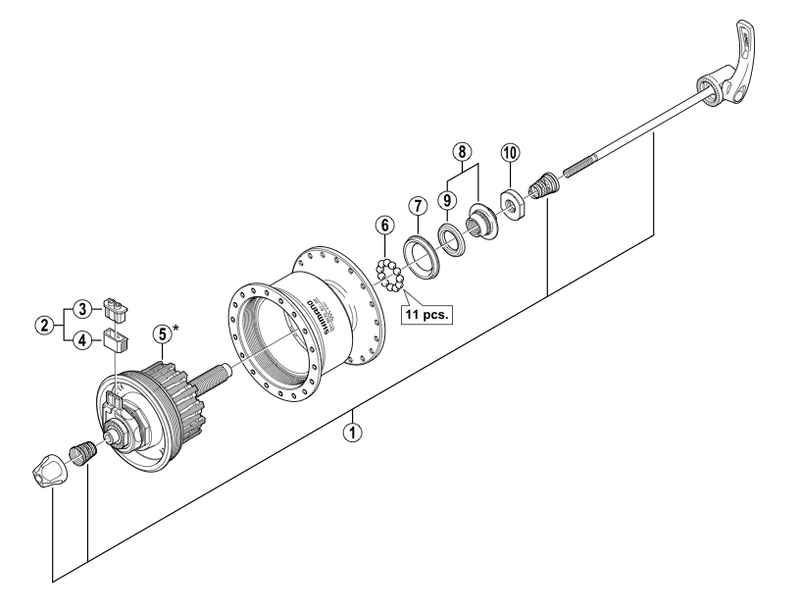 I disassembled mine… You could use a hollow axle from a QR hub upon reassembly. The glued on nut/spacer got me too :-). Watch out for tightness of the output side bearing holder …mine wanted to back out after a few miles (and apply load to the opposing side bearing!). Excellent and very informative article. Thanks so much for putting the time and sharing this knowledge article. As for that stator retaining nut, I tried to remove it until the metal began to distort. It wouldn’t surprise me to learn that they used some kind of really strong LocTite. I haven’t had any problem of the output side bearing holder coming loose. 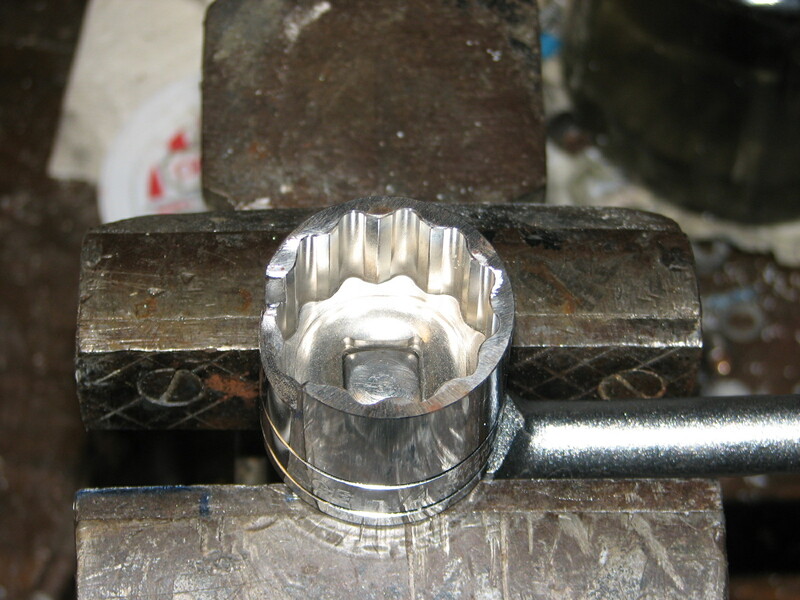 I actually did the final tightening with the socket held in the vise (image 17) and cranking the rim. Thanks a lot. By this chapter I was able to replace the ball bearing on the electric side (the most difficult of course) by the SKF 6001-2RSH after 256 KM. One of the balls was broken and the bike is out of warranty (four years old). We only use them on our holydays. They are great bikes and I forgive the makers. Thank you, Steve, for this in depth article. It helped me fix one wheel already and now it is turn of second one (one year between purchases and one year between failures). I am still considering to put there angular contact bearings, but looks like price for sealed ones are way too high so far. Glad you were able to fix your wheel. I haven’t worn out another hub, so I haven’t had a chance to repeat the process. Actually, for the last 10 months or so I have been riding on a prototype of the “Joule 3” (http://www.thinkbiologic.com/products/joule-3-dynamo-hub), one of which I was given to evaluate for winter performance. Last winter was very mild in Chicago, so it hasn’t really been tested yet. I have over 800 miles (~1,200 km) on the hub. It produces the same amount of power as the earlier Joule hubs, but is markedly smaller and somewhat lighter. Sadly, when the time comes to replace the bearings, I’ll have to start all over again! Steve, excellent work. You may be happy to know that your instructions are almost 100% applicable to the Sanyo NH-H27 hub as well. However, in replacing the bearings for that hub, I’ve found that they are closer to a 12.5mm ID, instead of the 12mm ID that the 6001-2RS should (?) be. As a result, my existing axle+stator won’t go into the new bearings. 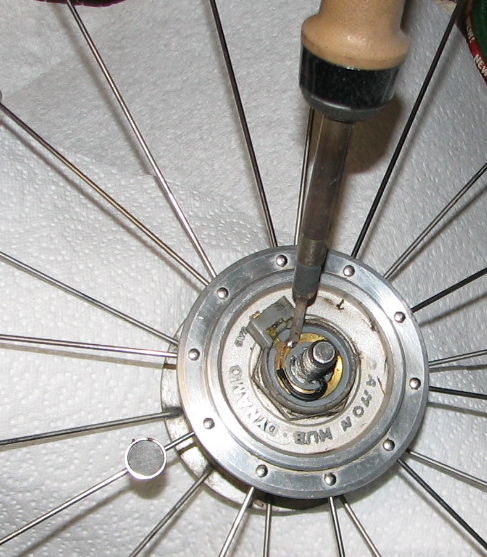 Did you happen to take any measurements before reassembling your hub? I’d like to know if I have some non-standard axle or other variation. Thanks, Hugh. Glad the information was of at least some use. I’ll check my records to see if I recorded the diameter of the axle. I can also measure the inside diameter of the bearings, which fit my axle perfectly. Stay tuned! Steve, apparently the bearing for the Sanyo hub is a 6001-8. The “-8″ apparently indicates a 0.5” bore diameter. I had to call a bearing supplier to get in on the secret. Lesson learned (by me) about trusting numbers taken from dust seals. I’m glad you go the problem solved, Hugh. Sadly, I did not record the dimensions of the axle. IIRC, I just looked for bearings with the same number and it sounds like I lucked out! The strange thing to me is that the hub I serviced is also made by Sanyo; you’d think the bearings would be the same, but I guess the design can change for a number of reasons. Great article. Will use this valuable info to get mine working again too. This article is great but it contains a mistake that led me to ruin my hub. It was very tight and I trie even to open it clockwise. Finally I followed your intructions and assumed it would open counter-cockwise. Fatam mistake, I ruined the thread and the lid has cracked. At least these Biologic Joule II hubs can have the RHS bearing replaced fairly easily; Shimano dynohubs are bit harder to get at, from what I’ve read. I recently obtained a dynohub for my Dahon thinking it a good idea. I find that when you turn it, it is very stiff – much stiffer than I’d imagined it to be. I thought dynohubs were relatively free running, but this is my first one, so have no practical experience of it. I managed to slacken off the side with the cone bearings, thinking both sides were like this. According to your post, this isn’t so. Thus far I’ve not done much more exploration for the reasons you mention – damage to the hub itself. Is it possible that the cassette bearing is in some way corroded or damaged? Very useful article. Many years thinking it was lost. Now works again. Thanks a lot. Regards from Bogota, Colombia. I think it is very unlikely that the bearings are corroded. 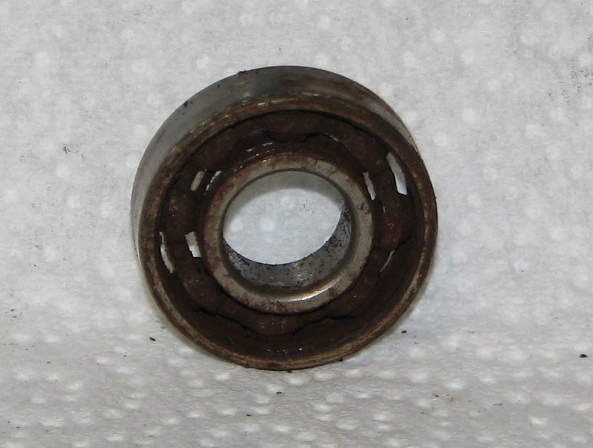 If worn, they have to be replaced , they are NOT cone bearings and cannot be adjusted. They do feel like they have a lot of drag when you turn the wheel by hand, even brand new with perfect bearings. People who know more than me have assured me that that is negligible when you are riding. I hope it is true. About opening the hub, I posted before that the article is wrong about the the direction the lid opens. I have to add that I am not sure about this hub. This is the first generation Joule hub, and the one I opened is the Joule II, both made by Sanyo, much the same construction, so much so that I neglected the differences and followed the instructions. In the case of mu hub it opened clockwise. So bear this in mind and try both directions, it is very tight and most likely has some sealant on the thread. Thanks for your thoughts. I found a Dutch forum that said exactly what you did about the “gritty” feeling of the hub. The one I have does actually have cone bearings (don’t laugh!) so they got a little more grease… and I popped it on and it works perfectly. I will add that since it felt tight, I didn’t want to ride it only to find I’d scrunched all the bearings in a nice new hub! Brilliant you saved me a lot of effort and money. I have two Tern fold up bikes with Bio Joule 2 units fitted. One had a crunching sound (not bearings) so I started to take it apart with the aim of removing the stator and tossing it and making the hub freewheeling. I thought until I found you blog that I would have to de-spoke the wheel but now I see the outer bearing assembly screws out using a socket. I too thought it necessary to grind off the socket to get max purchase, I will put the socket in a lathe and bring an angle grinder up to it. The reason I am converting the hub is I have had difficulty buying a new wheel/hub to suit a 74mm fork, at least in Australia that is. I have a WordPress blog too http://www.tbeartravels.com have a look and search Swiss Bike Mission. Thanks again. Today I buy a socket and get on with it. I had no expectation that the article would be this helpful. Thanks for the report. FWIW, I have a newer “Joule”… sort of ~2.5. It was an early trial of the Shutter Precision hubs which I got to “road test” on my old Dahon Mu XL. I have since transplanted it onto my Tern Verge S11i, which has almost 5,000 miles on it. The S-P hub is much more compact than the older Joules. I had been waiting for the new hub’s bearings to fail so I could try taking it apart, but I saw that S-P has a repair option. It seems to involve shipping the hub to South Korea though! Hello, thanks to your great foto series and report I could repair my bike! Thank you very much!